The average price for a home in Auckland, New Zealand’s most populous city which is located on North Island, is now just over $1 million. The media focuses on how impossible it is for young people to buy a house, with a side mention of how difficult it is for nurses, service workers and teachers, and how the Auckland problem is spilling over to the entire country. There has also been a great deal of publicity in the last six months about homelessness, with a marae (a Maori meeting house and grounds) in Auckland shaming the Government into action by opening its doors to the homeless for the winter. But there is another big issue that is almost never mentioned – the lost potential public revenue from land rent. Land rent is what the occupier would pay to the public if the public owned the land. Many have explained that the rise in the value of homes is really the accumulated land rent. It is also called the capital gain or unearned windfall. Recent figures from Quotable Values New Zealand allow us to work out the on-paper profit for our country’s homeowners and for Auckland’s homeowners. This represents their realizable assets, which enables homeowners to borrow money to be spent on other purposes. This calculation acknowledges that the figures are the houses that are sold only. Houses sold in that period were more like one tenth of the housing stock. If my neighbour’s house sells for $1million and ours is similar we know ours could sell for a similar price. The bank recognises this as the value of our asset. The fact that I had a huge mortgage makes not difference. Supposing I only have $200k and buy a $900k house, selling it a year later for $1 million. I make a profit of $100k because my deposit of $200k has turned into $300k. Let’s first consider Auckland, where the figures are the most dramatic. House prices rose nearly 16% in 2015. The average uplift was $138,781. The total uplift in the value of Auckland properties was $64 billion: 461,669 (the number of residential properties in Auckland Council) multiplied by $138,781. Now supposing this uplift was publicly captured month by month in the form of a full land rent, as it should be. What would the council do with it? 1. Transfer half to the government, leaving $32 bn. 2. Set aside about $20 bn for infrastructure building and upgrading, including rapid transit, and debt relief, leaving $12 bn. 3. Sharing the rents is important. So the $12 bn could be distributed as a Citizen’s Rent Dividend to every man, woman and child in Auckland. The population of Auckland is about 1.58m, making about $7,600 available per person. That would be $38,000 for a family of five. That should help a few homeless families! Homeowners across New Zealand are $138 bn richer than last year. There are at least 1,771,2000 residential dwellings (2013 census). 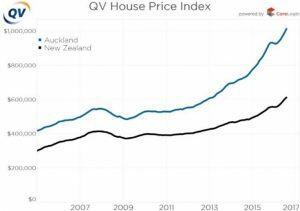 The average uplift in NZ house prices was the difference between the Aug 2016 price and the August 2015 price, which was $78,196. Multiplying these two, we find that New Zealand homeowners, on paper, have assets worth about $138 bn more than last year. The tax take last year was $66.6 billion. So the gain to home owners was more than double the tax take. All this is privately captured when it really ought to be going to the state. In comparison to the $138 bn uplift for NZ, the GDP last year was about $170 bn. There are several political obstacles that prevent us from applying tax reform. Aucklanders pay rates. Legislation mandates levies on capital values, thus requiring legislation for a change to rating based on land values. There is only miniscule awareness of this as a political issue. The viability of a centrally administered land tax is not good, given that there are at least three bank lobbyists for every legislator and neoclassical economics is in full bloom. The power of the landed and moneyed elite is so much greater in relation to the 99% than it has ever been. It has been legally impossible to impose land tax in NZ since 1992, though the Prime Minister seems not to know this. Early in 2016 he suggested imposing a land tax on property bought by foreigners. The idea died within a day or two. However this law could be reversed. 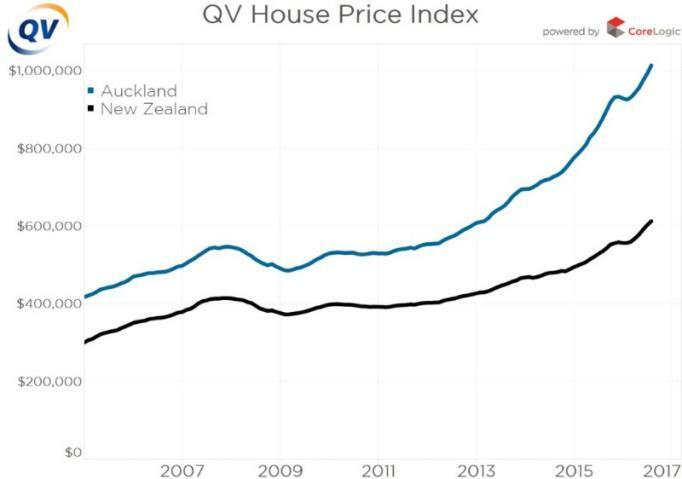 No politician wanting to be re-elected would advocate a measure that was going to bring down house prices and leave homebuyers with negative equity. A 5-6% land tax would actually be suicidal for politicians. Imposing a land value tax must be accompanied by cuts in income tax. All is not lost! The obstacles are not insuperable. Think about the untenable current situation of house prices and its destructive consequences as the wealth gap widens. We have to pioneer other ground breaking solutions. New Zealand had a Liberal Government in the 1890s which imposed a land tax to break up big land holdings. This was extended, but unfortunately it was at a higher rate per acre for large landholdings than for smaller ones, which was essentially unfair. This resulted in the emergence of a new political party dominated by larger farmers. Land tax never reached more than 20% of the tax-take, and income tax was gradually increased and extended. The same Liberal Government did, however, enact legislation to empower local government to hold a referendum where ratepayers could choose between land value rating systems and capital value. This was in place for 80 years and always resulted in the selection of the land value rating system. Cities like Wellington and Napier, which were constructed on this rating system, are spatially compact. If money buys lobbying power, then we have to be more strategic and try different tactics. This might point to governance reform giving much more power to local authorities and to even smaller governance units. Given that the banks have a vested interest in profiting from buying and selling land, and from the private ownership of natural resources and infrastructure, a host of local innovative actions may be the surprise option. And this would require huge resistance from local communities that are determined to share land values and preserve natural resource values. Maybe the old system should be left to collapse and die, and the new paradigm system reinvented at local level? We need to ask how land trusts can connect with localised governance units whose revenue is derived from land and resource rents. But where would the money come from to buy the land? Maybe we need to create a local currency designed to circulate at an optimal speed. Maybe when there is surplus locally it can be steered from the periphery to the centre of government.